Mohandas Karamchand Gandhi (1869-1948) was the inspiring and unstoppable political and spiritual leader of the Indian independence movement. He advocated and practiced total non-violent mass civil disobedience, which led India to independence from the British and inspired civil rights movements around the world. He is officially honored in India as the Father of the Nation. He was assassinated by a political extremist in 1948. 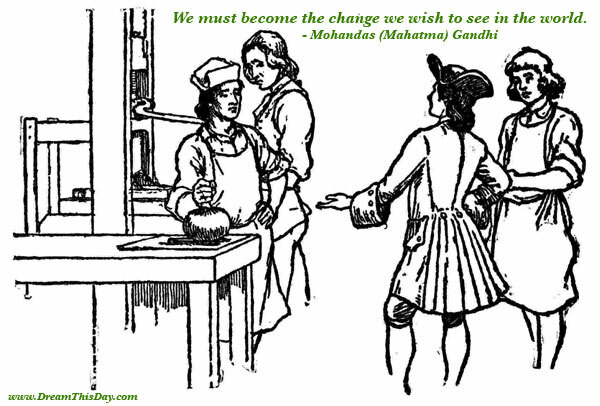 Mohandas Gandhi is often referred to as Mahatma Gandhi. "Mahatma" is an honorific title meaning "Great Soul" in Sanskrit, and thus is similar to the word "Saint" in Christianity. A man becomes great exactly in the degree in which he works for the welfare of his fellow-men. God has no religion. Each one prays to God according to his own light. Man lives freely only by his readiness to die, if need be, at the hands of his brother, never by killing him. Nobody can hurt me without my permission. Indira Gandhi (1917 - 1984) was Prime Minister of India from 1966 to 1977 and from 1980 until her assassination in 1984. Indira Gandhi was not related to Mohandas Gandhi. Thank you for visiting these Gandhi Quotes by Mahatma Gandhi and Indira Gandhi.